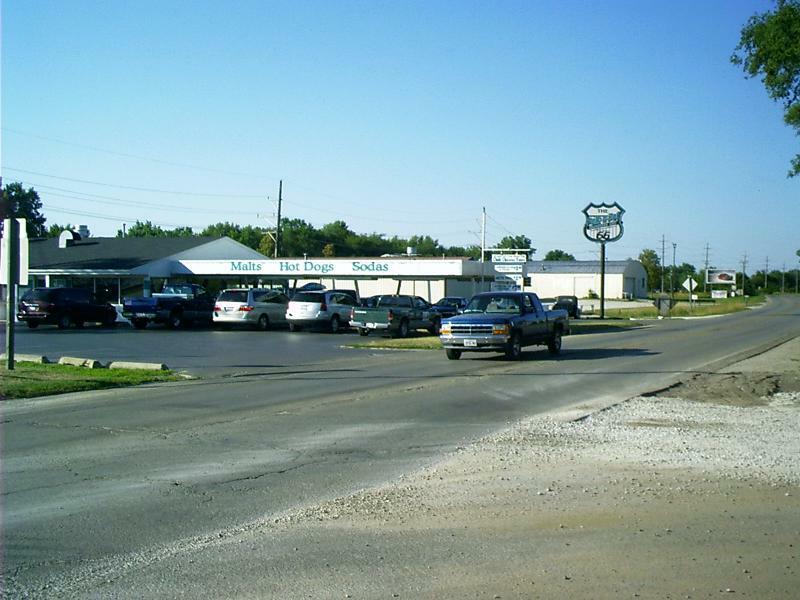 Here are snapshots I took along alignments of Old US Route 66 between Joliet, IL, and Clinton, OK. The white building at the end of the block is the Eagle Hotel. It is closed for renovation. 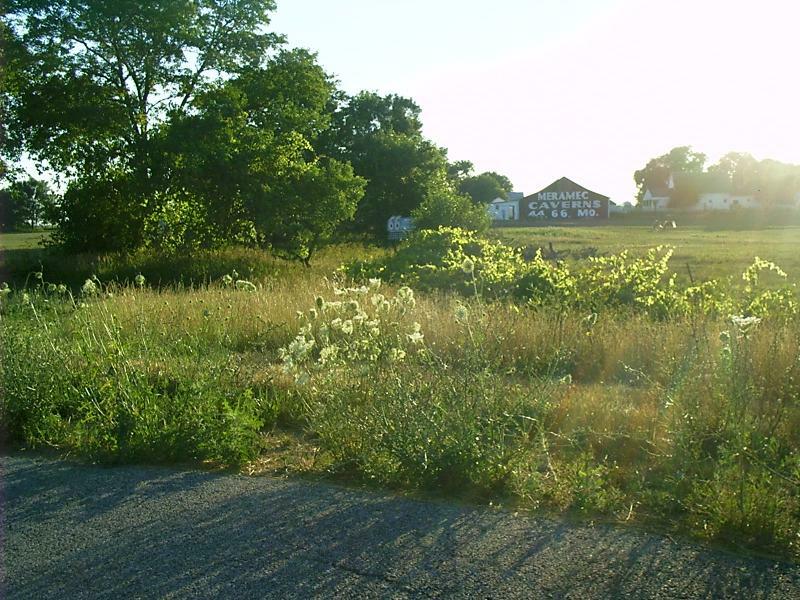 It antedates Old US Route 66 by 90 years, first catering to riverboat and stagecoach travelers along the Kankakee River. 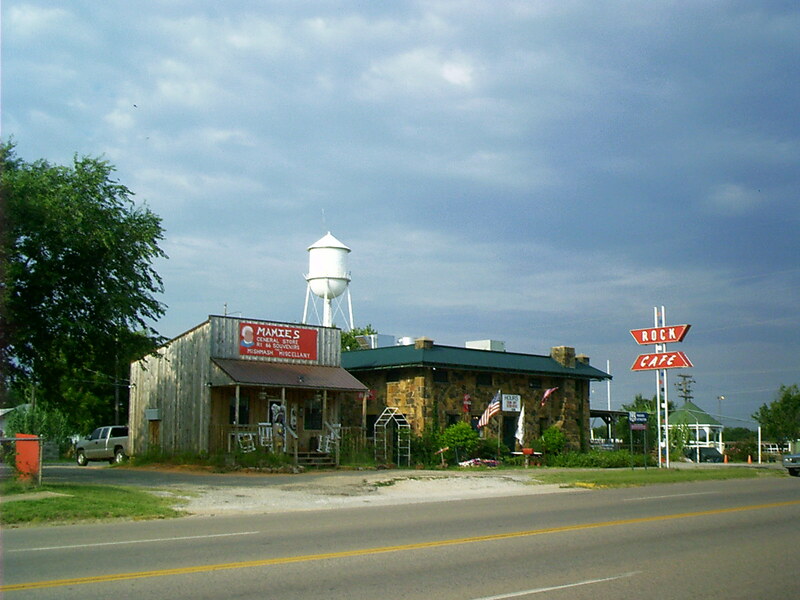 [Weiser, Kathy R. "Legendary Route 66." Legends of America n. seq. (2004): n. pag. Online. Internet. 9 Aug. 2005. Available http://www.legendsofamerica.com/66-Mainpage.html. 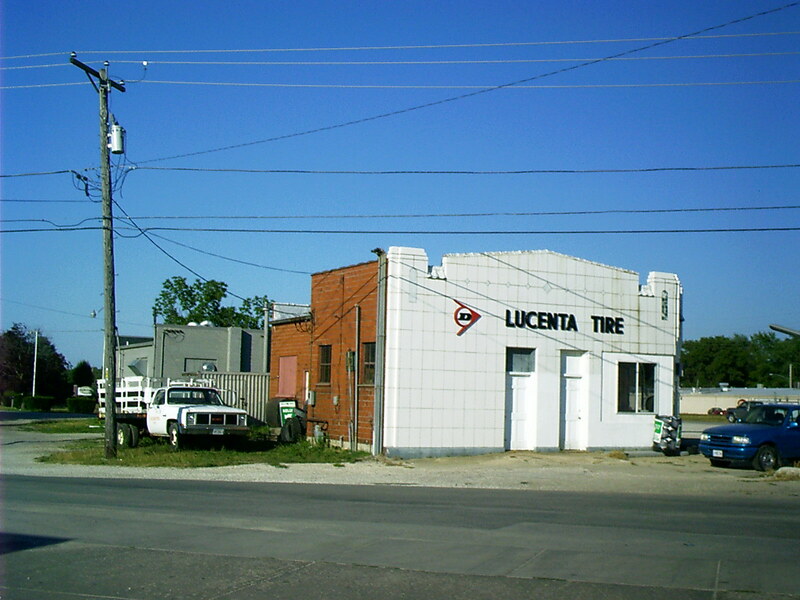 This is an old Art Deco service station veneered in antiseptic white ceramic tile. Obviously, only the sides facing the main drag were given the full treatment. Do they have curb service? Is the Pope German? 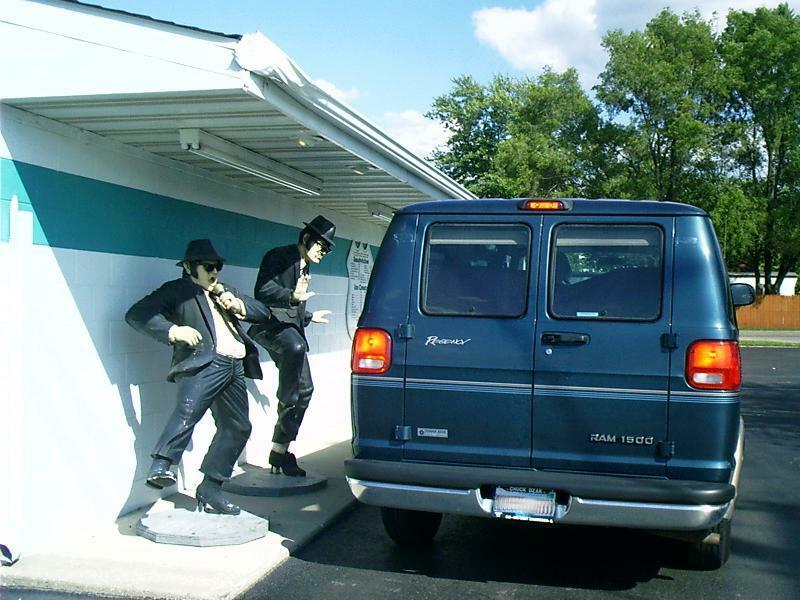 This drive-in probably is a bit different from the one you frequented as a teenager. 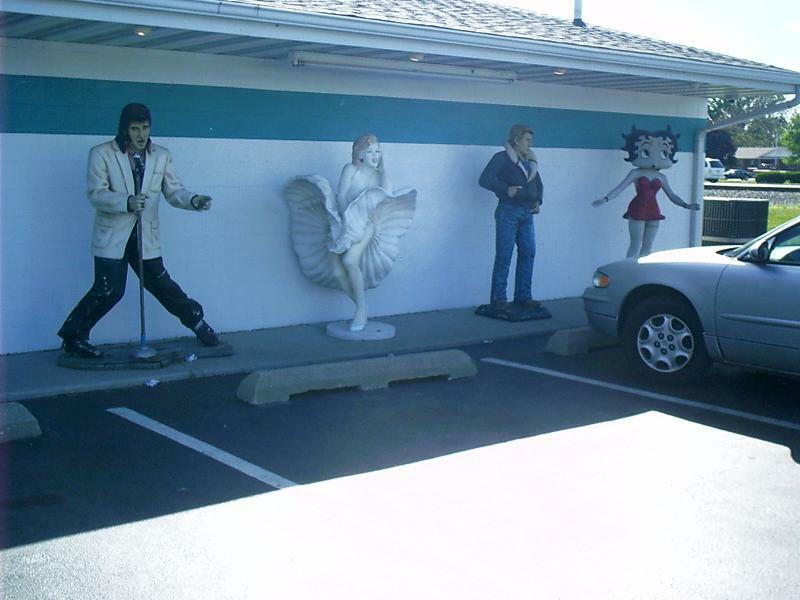 For one thing, the decorations are life size, and they're outside. John and Dan keep the drive-through line moving. Now, there is a little, old speakeasy just north of Gardner, IL. As is the way of these places, it does not announce its presence, and you will miss it if you aren't looking for it. In fact, on a trip headed north, I merely glimpsed it across a large gravel parking lot and had to turn around to go back. To southbound tourists, it is entirely hidden behind the brush growing along the banks of the Mazon (muh ZAHN) River. It's called the Riviera (est ca 1928), of all things. You enter by the side door, but you don't step up to the ground floor; instead, you wind up in the basement. The Riviera manages to convey the impression of the interior of a dark, dank grotto without burdening its patrons with the actual fact. This is a considerable achievement, which I chalk up to modern air conditioning. There are a number of tables complete with tablecloths for the restaurant trade. Note: There is a crowd on weekends. There is a bar. When I was there, the bar was crowded. (The Gardner regulars, I guess, carpool.) I ordered a Route Beer, which the bar maid (who was older than I) took pains to assure me was not an alcoholic beverage. 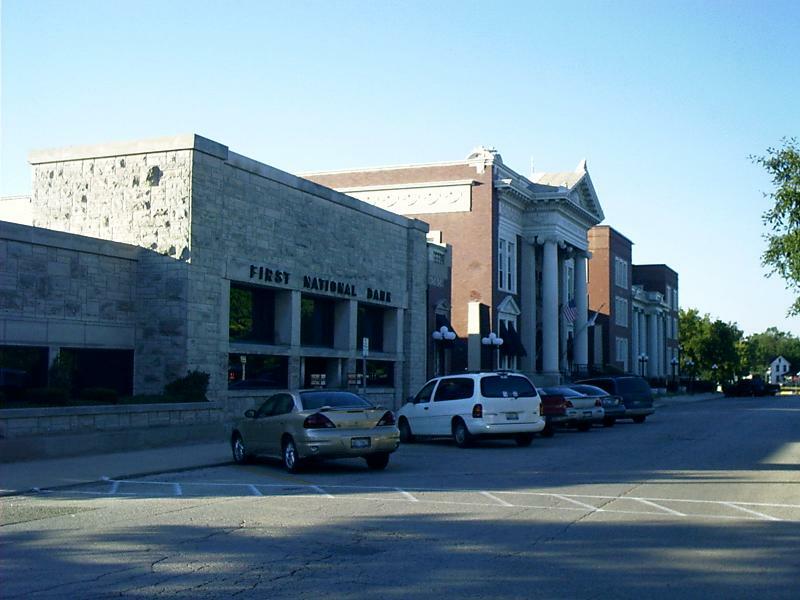 The limestone bank building just across from the depot was designed by Frank Lloyd Wright. The brick complex in the background was built in 1903 to house the Keeley Institute, a world-famous sanatorium. The Keeley Institutes were franchise facilities for the treatment of addiction to alcohol, nicotine and narcotic drugs. 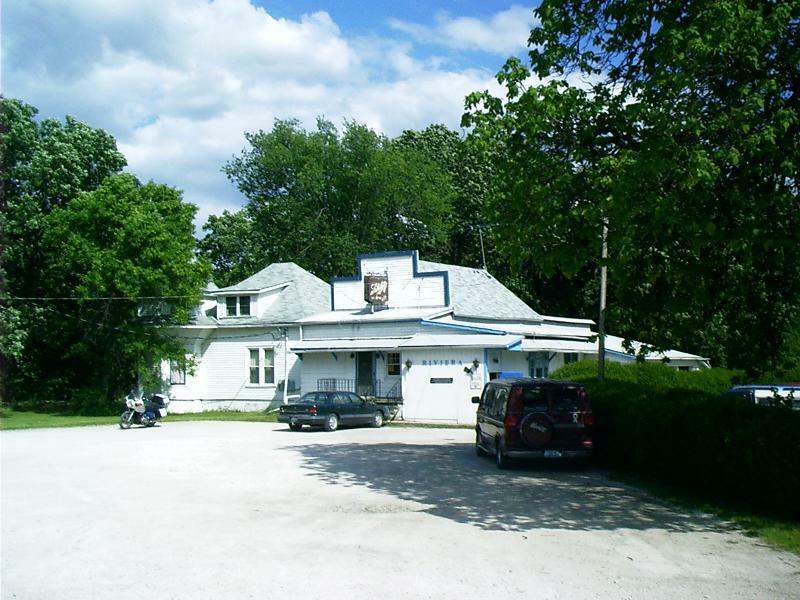 Dr. Leslie E. Keeley opened the doors of the first Keeley Institute, the first medical institution to treat alcoholism as a disease, in Dwight, Illinois, in 1879. Keeley's Cure relied heavily on injections of "bichloride" or "double chloride of gold" (hence the term "Gold Cure"). Surprisingly, these centers had a 50 percent success rate. People who recovered from their problems stayed well because, in addition to the seemingly useless injections, Dr. Keeley encouraged group therapy and the exchange of information, as well as getting community involvement. 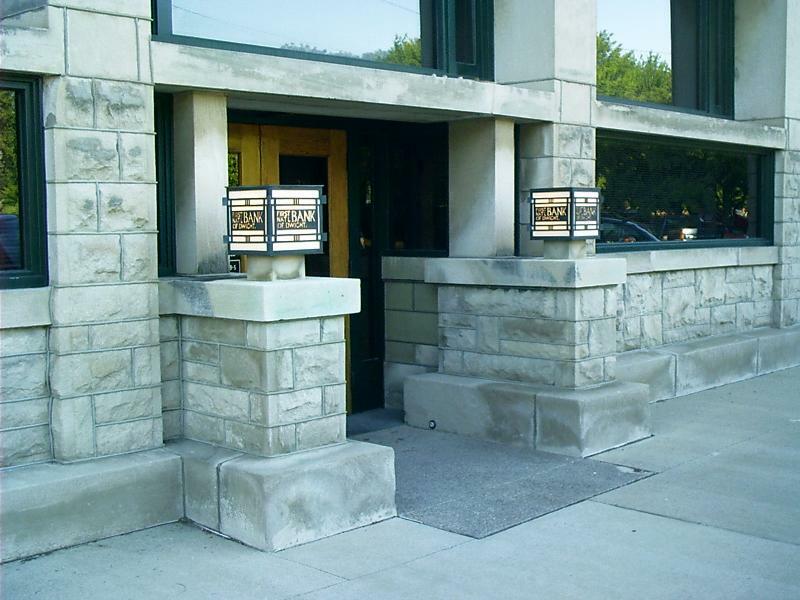 The pillars on either side of the main entrance jut into the pedestrian right of way. Apparently, the bank dominated whatever zoning authority existed at the time. In contrast with the Keeley Institute for recovering alcoholics up the street, the building imposes not only upon passersby but upon patrons, as well, who must feel that ducking through the front door is required. I shouldn't be so hard on a native Wisconsinite. After all, Frank Lloyd Wright is the author of a quote I only recently stumbled over after weeks of pursuing Route 66 references throughout the width and depth of the World-Wide Web. He said that Route 66 is "a chute down which everything loose in this country is sliding into Southern California." 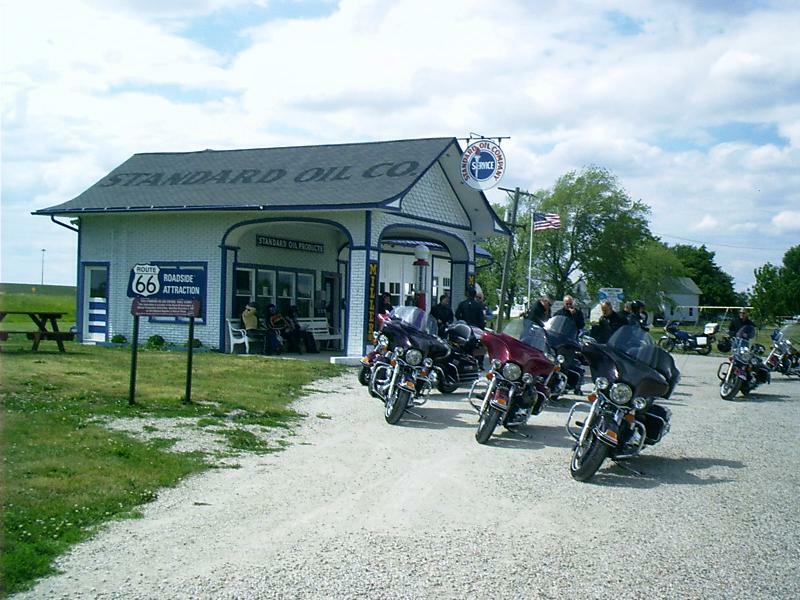 Odell, IL, has a Standard Oil service station that kept going, handling a succession of different brands of gas, until 1999. The tools and leaky containers are still there. Thus, the repair bay looks and smells very much like mechanics' shops I remember from childhood. Somebody neatens up and washes the windows though, so it is neither as cluttered nor as dingy as a true-to-life restoration might be. 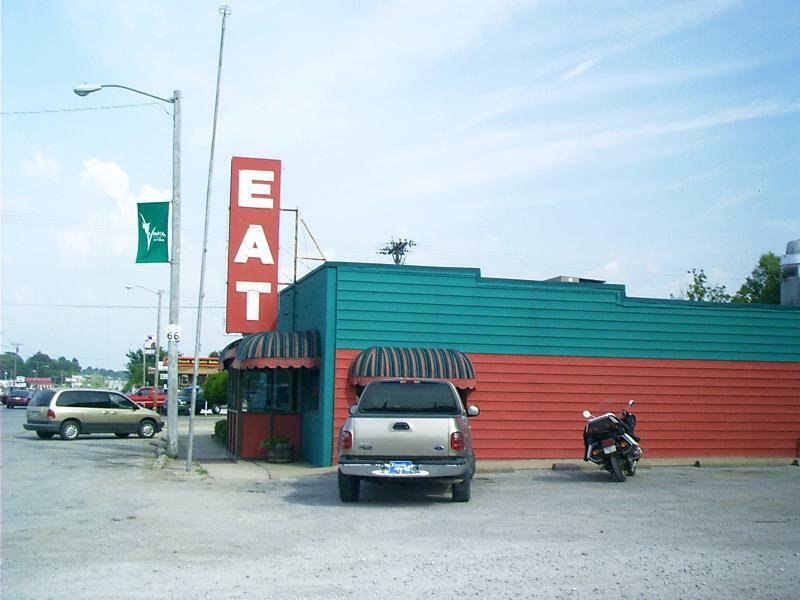 It was the habit of Bob Close to go into downtown Odell for lunch every day. He left the pumps on while he was gone. If a customer came by and needed gas, he/she would pump it themselves and write down on the side of the gas pump their name and how much they owed. Later in the week they would drop by, pay the bill, and wipe their name off the pump. This seemed to be a very good system, which allowed Bob to get a hot meal and his customers to get the fuel they needed. At least it was, until that fateful day that the Sinclair representative stopped by a lunch time. He saw the "Gone to Lunch" sign on the door and decided to wait. While he was waiting, he saw what looked to him like someone had been doodling on the side of the gas pump. "We can't have that," he thought to himself, so he decided that he would help Bob out. He got a rag and a spray bottle of cleaning solution from the trunk of his car that he carried for just this type of occasion. It was clean as a whistle when he was through. Bob didn't lose a dime. When folks heard what had happened, they came in and settled up their debt. That is just the way it was back then. This group of motorcyclists was from Great Britain. Their tour package included rented Harley-Davidsons. They were exploring the side roads on their way from Chicago, IL, to Los Angeles, CA, via Old US Route 66. A farmer who owned a barn near a highway could have one wall painted for free as long as he was cool with whatever advertising slogan a promoter wanted to put up. I remember "See Lookout Mountain" everywhere along US 41. "Chew Mail Pouch Tobacco" was omnipresent, too. When highway rights of way were narrower and traffic averaged under 40 mph, there were scads of barns advertising the Meramec Caverns along Old US Route 66. Of the few left, this is one of only a couple that have been restored. 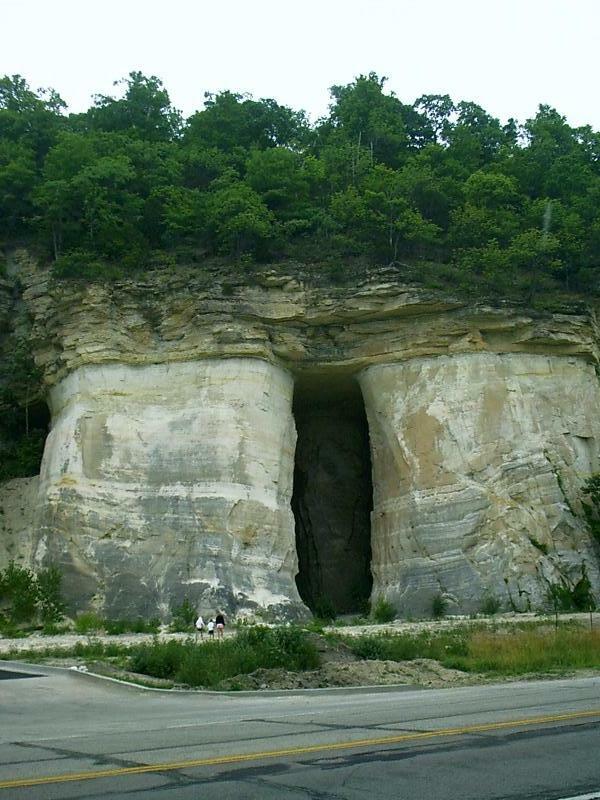 The cave is 266 mi from here. Old US Route 66 followed the Chicago and Alton Railroad corridor through Illinois just as I-55 follows Route 66. 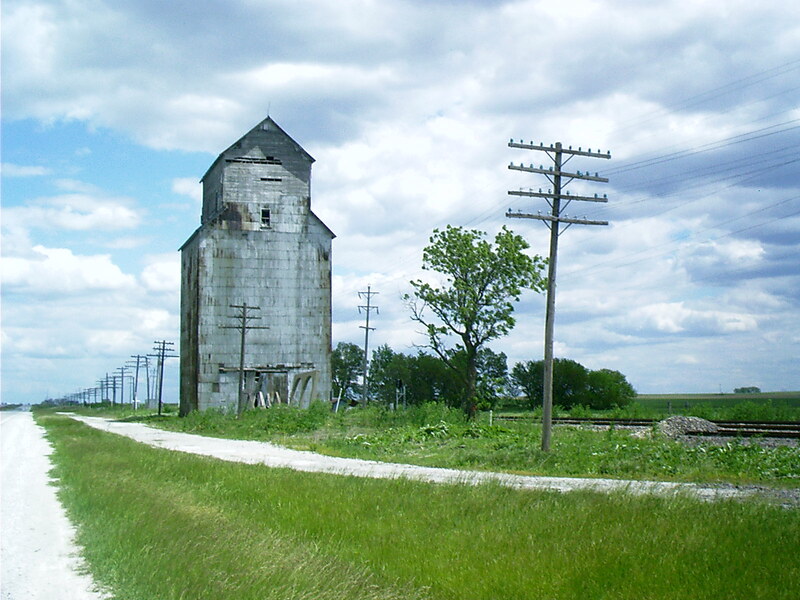 Other conduits were laid along the railroad right of way such as power lines and the bundle of open-wire telephone lines that used to be supported by the telegraph poles in this photo. The road between St Louis and Springfield, MO, was known as the Osage Trail or the Kickapoo Trail because it followed native roads. It grew into a mail route for stage coaches before the Civil War. After the Union Army erected a telegraph line along it, it was called the Old Wire Road. In that place, the telegraph preceded the railroad; although, in most places, their development coincided. 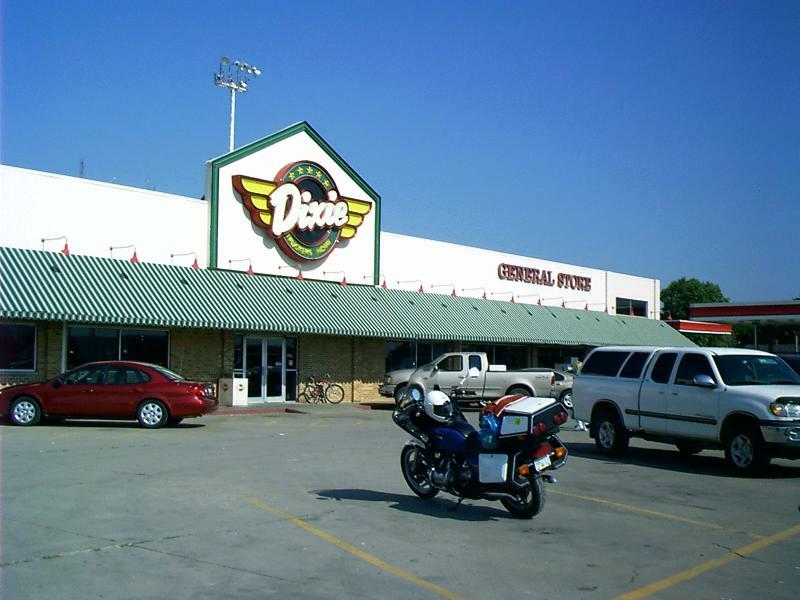 Dixie Truckers Home truckstops now do business from several locations, but the original restaurant leased space in a garage here, beginning in 1928. The operation expanded during the 1930s to include travelers' cabins. 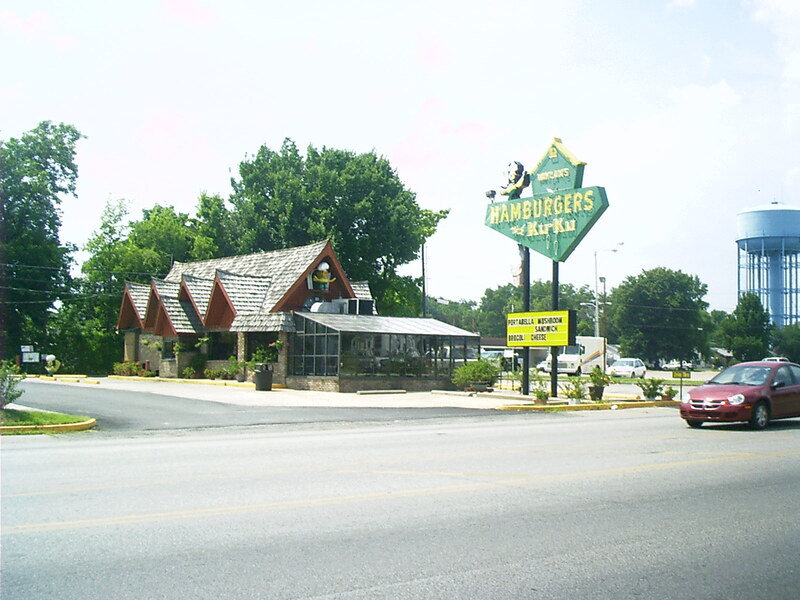 After a fire in 1965, the restaurant relocated to one of the cabins while the new edifice was built. Except the first one after the fire, the restaurant has not missed a day of operation. In 2001, control passed to a family corporation, which went bankrupt and was sold. The family attempted unsuccessfully to regain control. Recently, the business has changed hands a fourth time. This is a swanky joint. 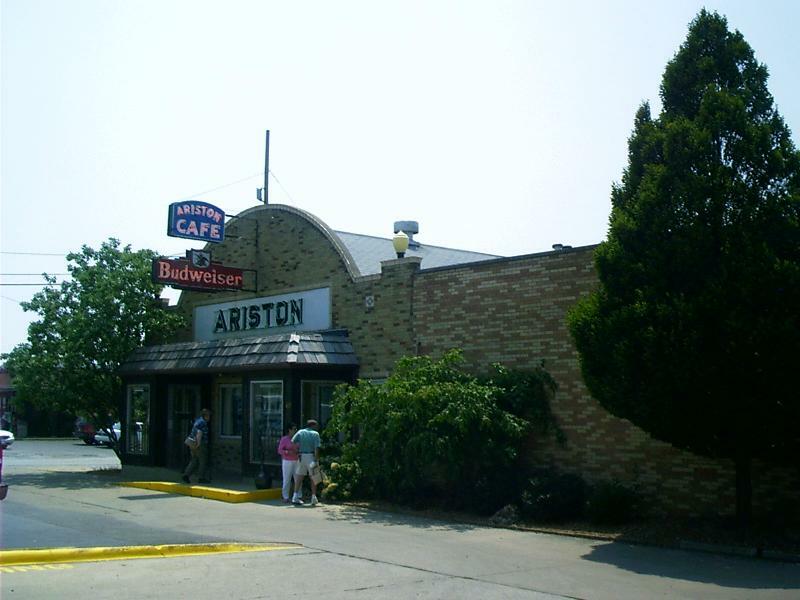 The Ariston Cafe, which is still run by the family that built it, has a blue marlin tacked to the back wall and harks back to a time when every successful supper club did. A sign behind the cash register says, "Welcome," in a dozen languages. Travelers should plan to eat at the counter in the afternoon because a bevy of blue-haired ladies will have staked out the tables; nevertheless, those merely passing through will receive just the right amount of attention from wait staff and management. 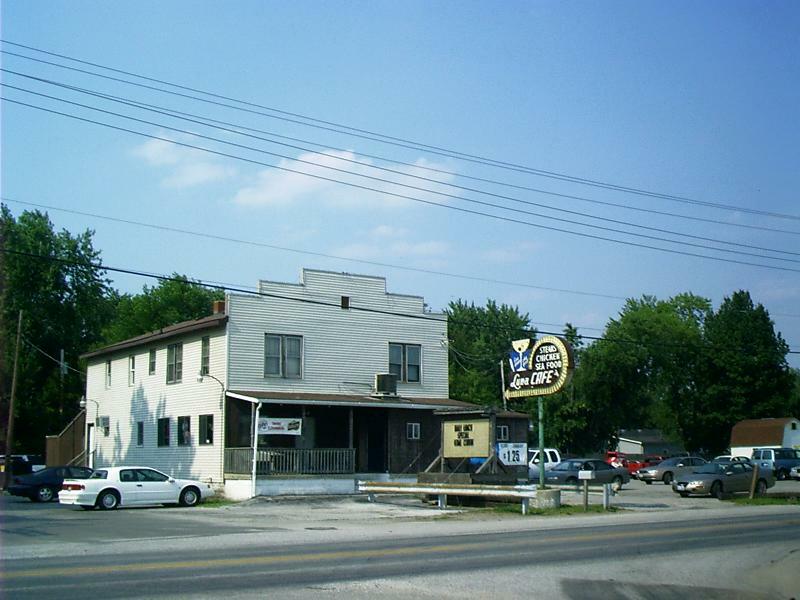 Today, this is a working-man's country tavern. A horseshoe tournament was going on out back when I was there. During Prohibition, it was a speakeasy. 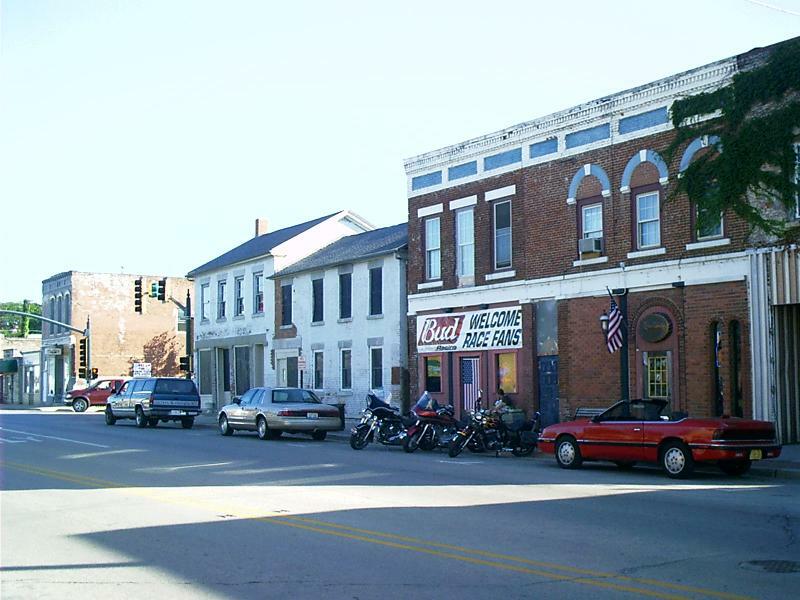 On the St Louis side of the Mississippi River, folks take just about every opportunity to explain that Jesse James (1847-1882) ate here, slept there, or shot somebody or other on almost every street corner in Missouri. In Texas, Louisiana, and Oklahoma, it's the same, except that it's Bonnie Parker (1910-1934) and Clyde Barrow (1909-1934). In Illinois, the principal bad actor is Al Capone (1889-1947), who was connected with commerce at the Luna Cafe ... supposedly. Rumor has it that the specialty of the house was prostitution. "Eat-Rite or Don't Eat at All"
Because of a chemical fire in downtown St Louis, friends I was staying with declined to take me out to eat here, but not all was lost. Eat-Rite is a chain, so we just went to another one. Apparently, when you've seen one, you've seen them all. This is the historic original, however. 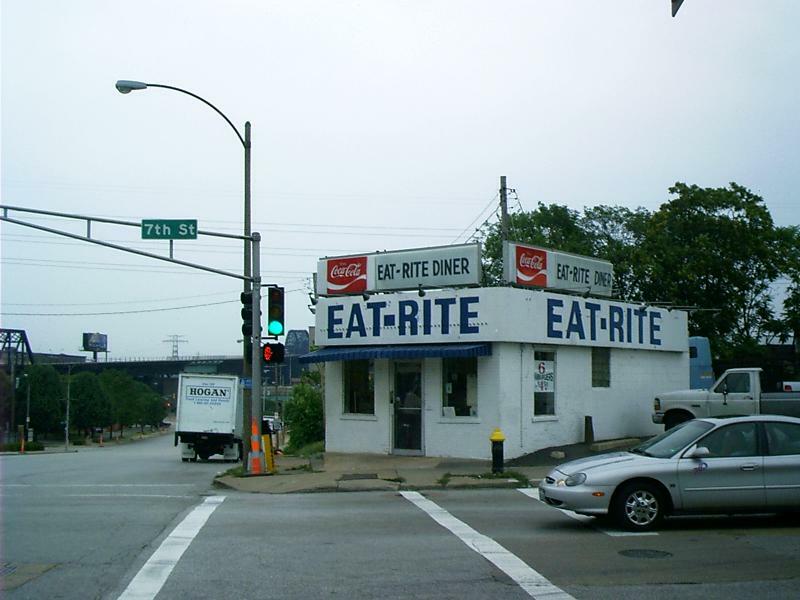 It was first called Eat-Rite in 1940 and is located near the Missouri end of the MacArthur Bridge from East St Louis, IL. The MacArthur Bridge was opened in 1917 as the Municipal Free Bridge because it was the only one that did not charge a toll. It was renamed in 1942. It closed to automobile traffic in 1981 after carrying the "City" alignment of Old US Route 66 for years. At Eat-Rite, the waitress does double duty as cook and cashier and, in no time, will dish you up a "slinger," which is not a drink but a plate of hash containing unadulterated and unbuffered potatoes, onions, hamburger, eggs, cheese, and chili beans. I defy you to find that on any diet yet devised! As a hair-of-the-dog antidote, Ted Drewes Frozen Custard is worth a visit. 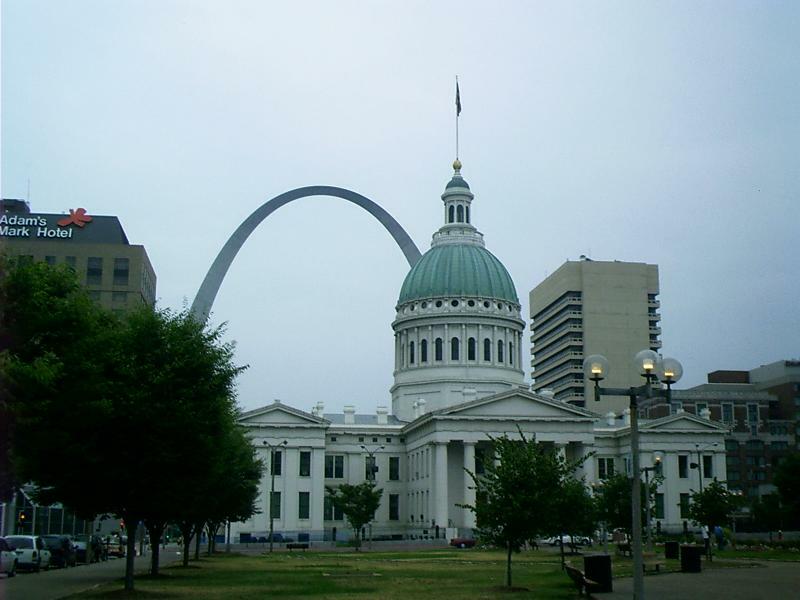 Designed in 1947, the arch is 630 feet wide and 630 feet high. It's visible from all around the area. What's this ~ a cave in sandstone? No, it's a mine shaft for extracting high-grade silica, the raw material for glass. 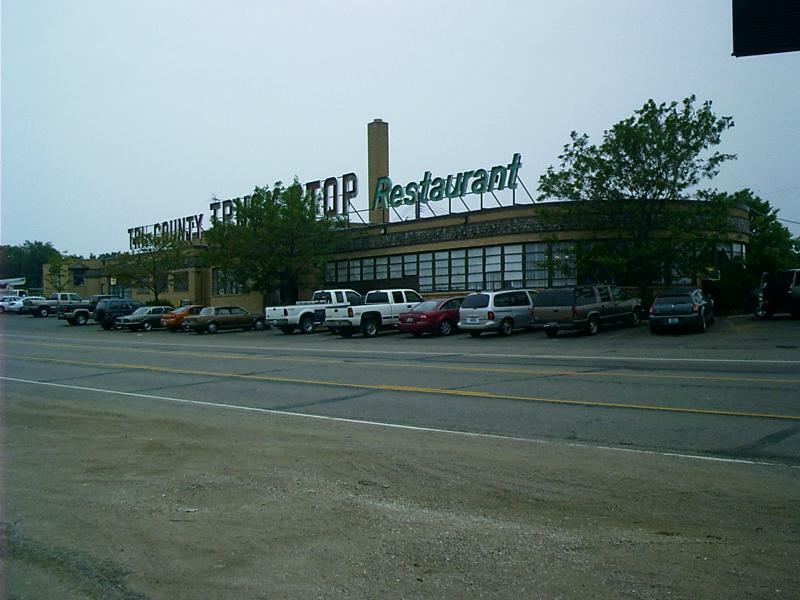 Once the "world's largest roadside restaurant," this facility is still doing a respectable business. 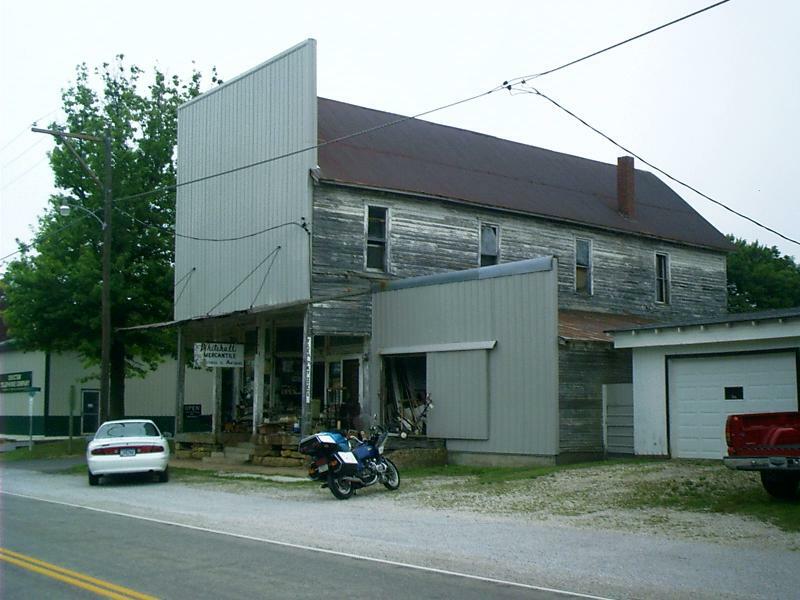 This was a general store and post office. 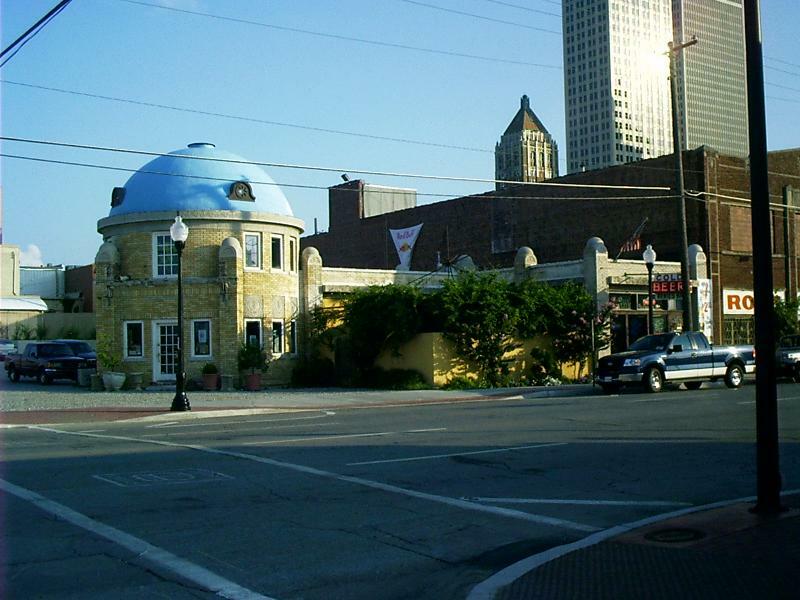 The Independent Order of Odd Fellows Lodge met upstairs. Don't stop here ... unless you have oodles of time to admire second-hand Americana and to gab with a proprietor who gives every indication of being starved for attention. I don't think that's the case. He tells of shipping merchandise back to Europe and Asia for all sorts of tour groups that do stop here. When I was a kid, drive-in movie theaters were a big deal. Nowadays, those that are still in business are few and far between. Actually, this one was refurbished in 1998. Alas, the same cannot be said for nature programs on TV. Those who've gagged at Aussie Steve Irwin's, "Crikey, look at the size of those incisors! They're huge!" (Animal Planet) or dozed off to Mar-ty Stouf-fer's Wild A-merica would do well to remember that the original American TV wildlife series debuted way back in 1963. It was Mutual of Omaha's Wild Kingdom, and it was broadcast in color! I remember this because my parents weirdly insisted that my brother and I ritually watch it on Sunday afternoons. We had a TV, but it was black and white. An elderly couple next door had a brand new color set that they were intensely proud of, so we were forced to go there. We repetitiously pretended to enjoy it while they repetitively pretended to be pleased by our company. 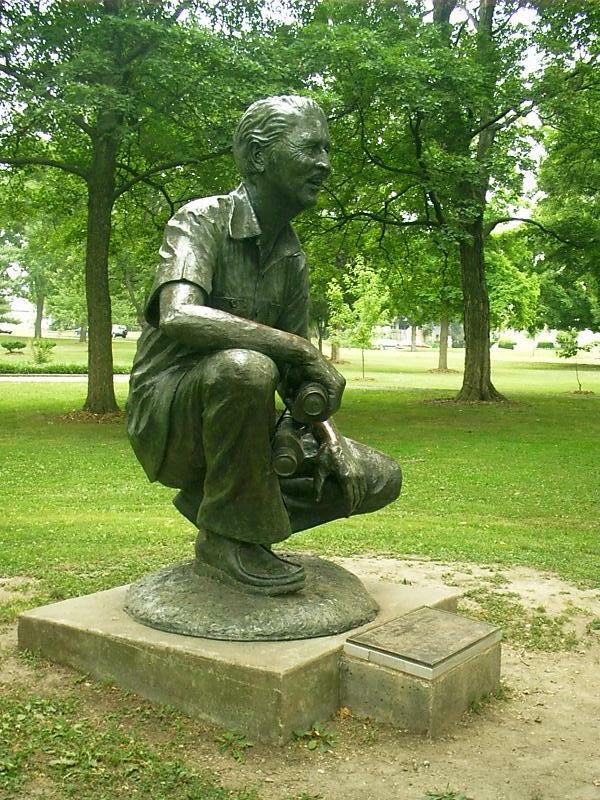 The show was hosted by Marlin Perkins (1905-1986), Director of the St Louis Zoo and native of Carthage, MO. The best you can say about it is that it was filmed on location. You never see reruns anymore because commercial segues extolling the prudence of buying insurance were part of the script. These "breaks" were reinforced by examples of the providence of nature (or lack thereof). They punctuated an overly dramatic and anthropomorphic storyline that led inevitably to the gladiatorial spectacle of co-host Jim Fowler's having the stuffing almost kicked out of him by Australian kangaroos, being trampled nearly to death by migrating herds of African ungulates, or partially asphyxiating in the grip of some huge new-world reptile while Mr Perkins remained crisply aloof. Sir David Attenborough (Zoo Quest (1954-1964), Life on Earth (1979), The Living Planet (1984), The Private Life of Plants (1995), The Life of Birds (1998)) has the gumption at least to do his own stunts. Thomas Hart Benton (1889-1975) was a native of Missouri. In his youth, he drew cartoons for the Joplin American newspaper. In his old age, he painted a mural for the city. It was his final large-scale work. 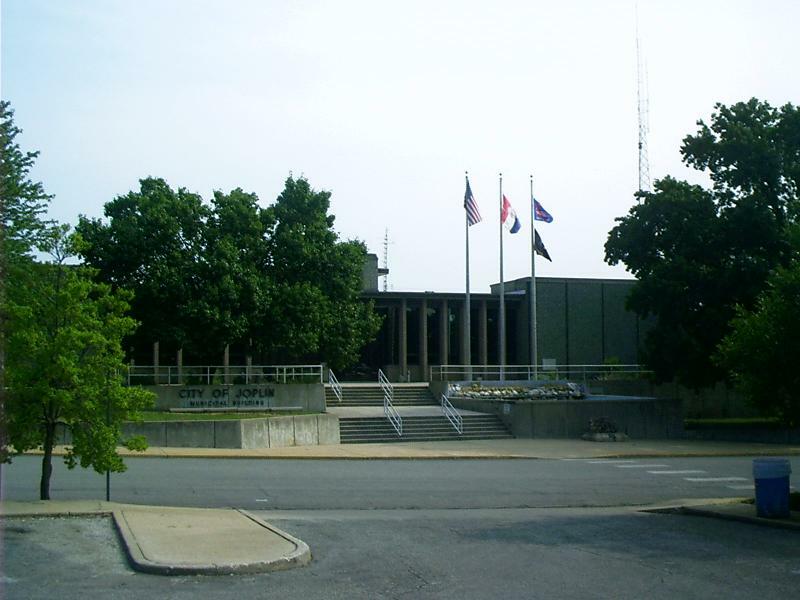 There is a display of correspondence related to this commission in the Joplin Justice Center, which used to be called the Municipal Building. Also shown are sketches he used to prepare the finished piece, and there is a clay study of one of the figures. Once upon a time, the painting was here. 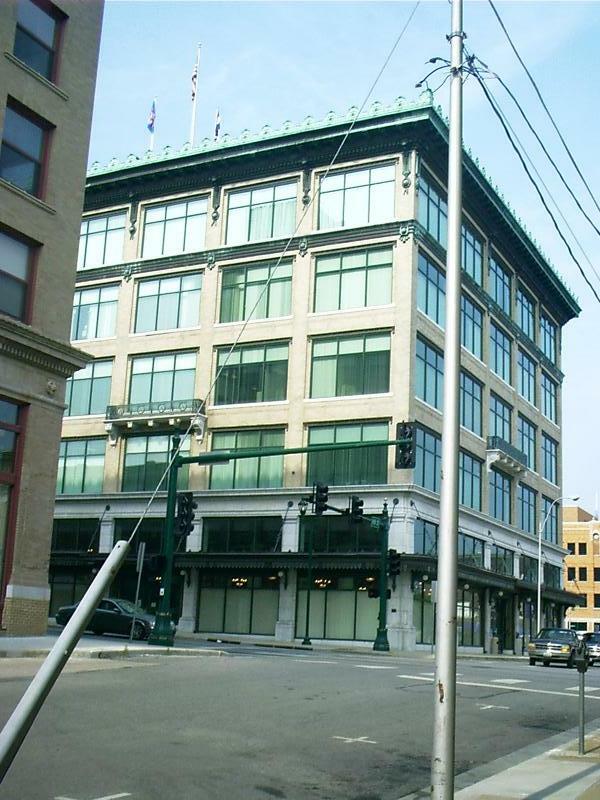 In an effort to reinvigorate the downtown, the Newman Building (1910) was refurbished and renamed the Municipal Building in early 2005. Apparently, it is now also known officially as City Hall. 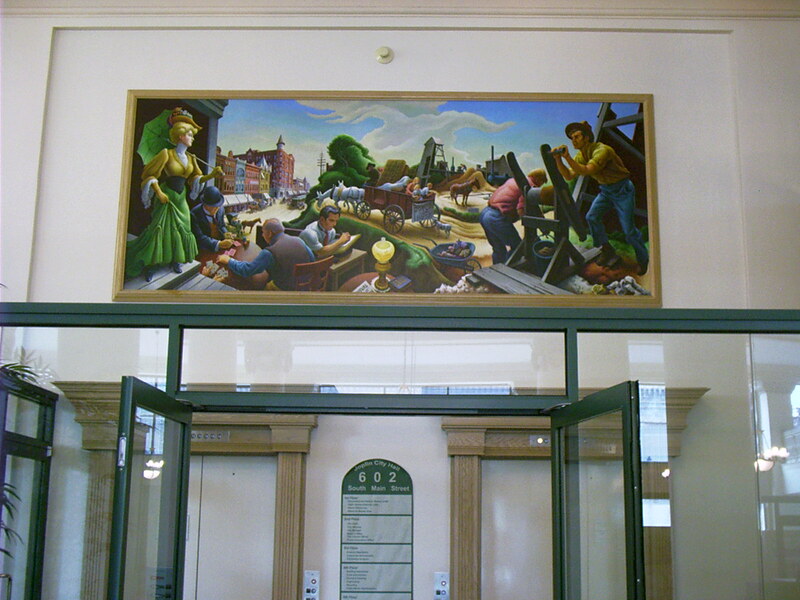 A few offices were shuffled out of the Justice Center into this building, and the painting came with them. It hangs on the wall of the elevator core facing the first-floor lobby. The name hardly seems apropos until you begin studying the outlandish roof line. The distinctive design of the building looked like a giant Ku-Ku clock, and the bird at the top chimed every hour. What a gimmick! In the mid-sixties there were over 200 Ku-Ku Drive-Ins in operation. ... not anymore; this is the only one left. I doubt that the enclosed patio and drive-up window are original. The outfit still serves a mean chocolate malt, though. The rehabilitation of this Spanish Mission Revival movie house was nearly complete in 1996 with the recovery, refurbishing, and reinstallation of its original Wurlitzer organ, but the auditorium chandelier wasn't back in its place until 2004. 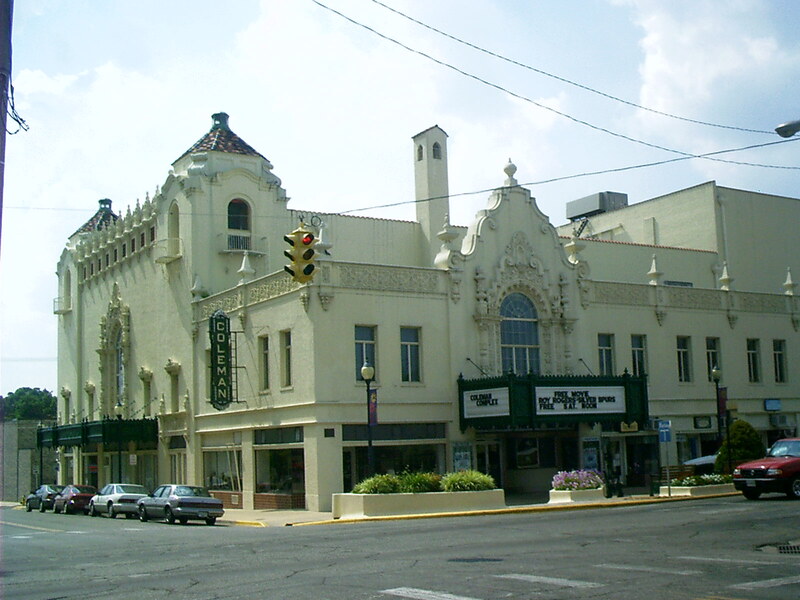 The Coleman Theatre seats 1600. The name of the town is pronounced My AM uh. Vinnie Ream Hoxie (1847-1914) was born in Madison, WI, and died in Washington, DC. In 1866 at 18, she received the Congressional commission to sculpt the marble statue of Lincoln that still stands in the Capitol rotunda. She completed the statue in 1871 in Italy, working from a bust of the President she modeled while he was alive. The likeness is said to be exact. 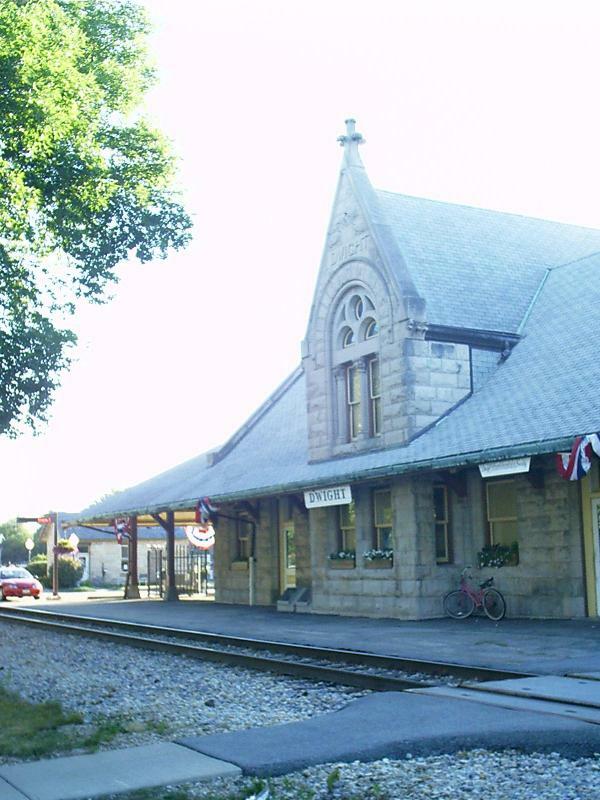 Elias C. Boudinot, a Cherokee Indian lawyer and businessman and a constant correspondent and perennial suitor, named the rail-junction city of Vinita in the Oklahoma Territory after her. Elias was the son of a famous Cherokee traitor or patriot depending on whom you talk to. His father and 34 others sold the Cherokee ancestral lands to the US government, resulting in the Cherokee Trail of Tears mass migration in 1838-39. 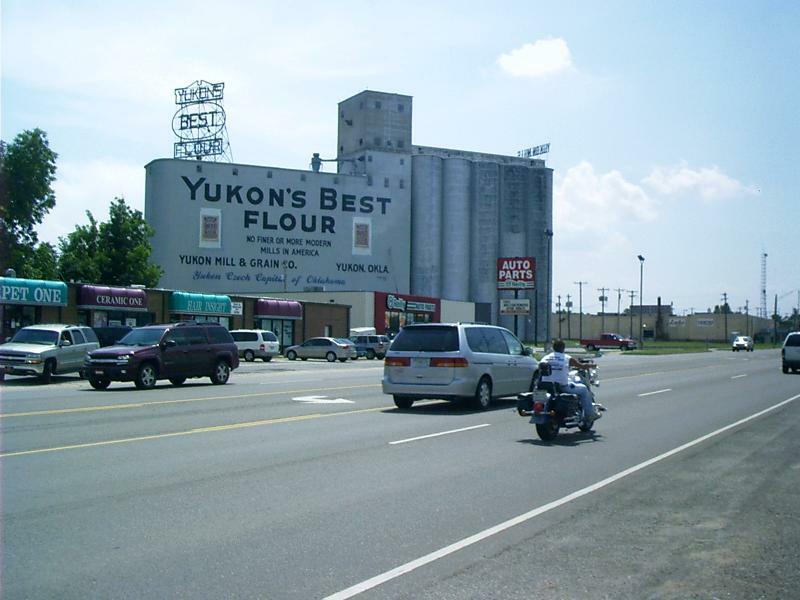 Not surprisingly, the sale of the land split the Cherokee Nation politically, and the streets in Vinita are named for prominent leaders and citizens on both sides of the dispute. 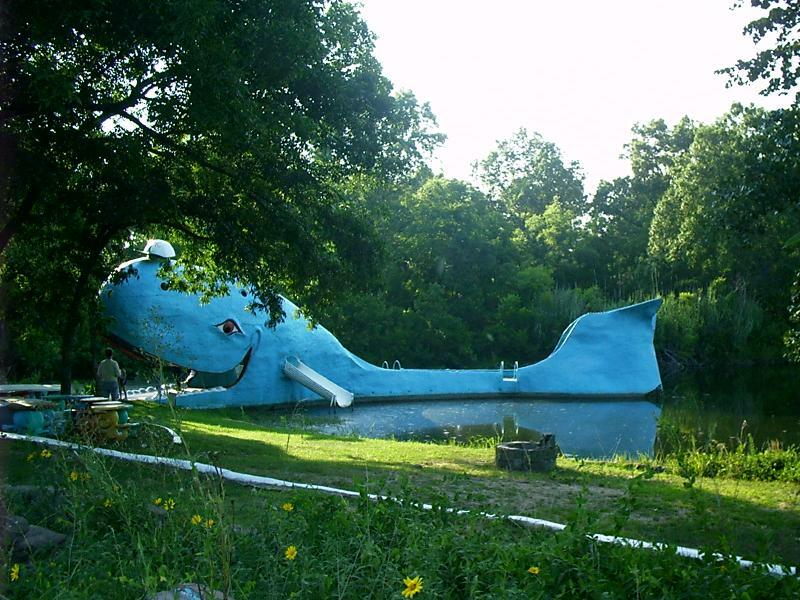 The blue whale is made of concrete. Consequently, it remained where it was poured in the early 1970s and was never burned down nor demolished and carted away after the surrounding water park and zoo went out of business in 1988. A portion of the grounds was renovated by Catoosa Chamber of Commerce volunteers and Hampton Inns in 1997. 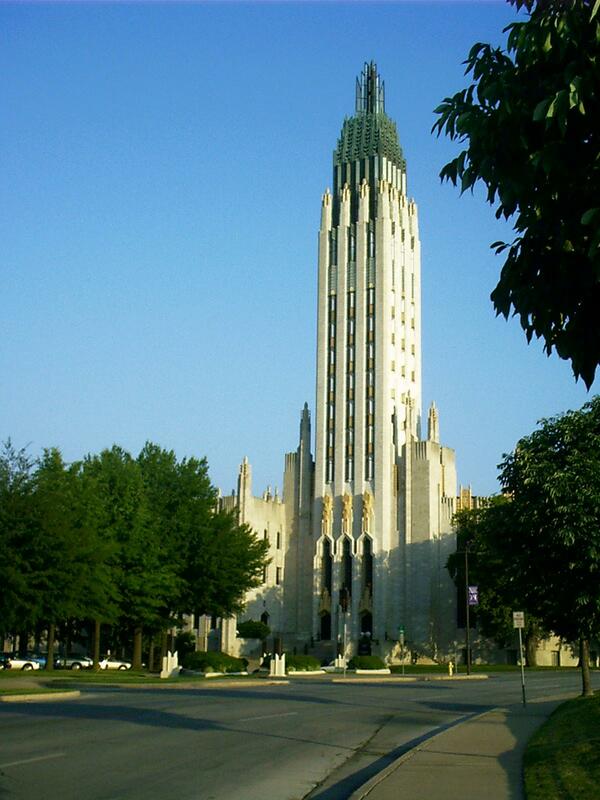 Tulsa boomed with oil wealth during the roaring twenties. Other cities that were built up during that period retain a smattering of Art Deco architecture interspersed among other styles, but no other place has such a dense concentration of the genre. Methodists are notorious for their unfortunate dealings with professional architects. This exceptional specimen, on the other hand, may have been a joint effort by the juvenile Art Deco prodigy Bruce Goff and his art professor Adah Robinson. It turned out quite nicely, even though its steeple suggests an office tower from some fictional Metropolis to today's pedestrians and sightseers. Truckers from coast to coast knew of Mamie and the Rock Cafe. In the days before CB's, pagers, voice mail, and cell phones, truckers could pull into the Rock and receive their messages. If a wife needed to get in touch with her traveling husband, she could call a message into the Rock, and it would be faithfully pinned to the wall to wait his arrival. On-street parking leaves a little to be desired from the biker's point of view, but ~ not to worry ~ the alley leads to a grassy back lot on the same block catercorner from the cafe. You enter beneath the trellis at the side. I ordered a plate of beignets (bin YAYs). These are deep-fried yeast-dough pastries topped with powdered sugar that typically are associated with the cuisine of New Orleans, LA. They were prepared to order, came to the table hot, and, washed down with an ample cup of good coffee, proved to be an excellent start on a fresh day. Somehow I doubt they were on the menu in 1939, but I could be wrong. Update: The Rock Cafe was destroyed by fire about midnight on Tue, 20 May, 2008. 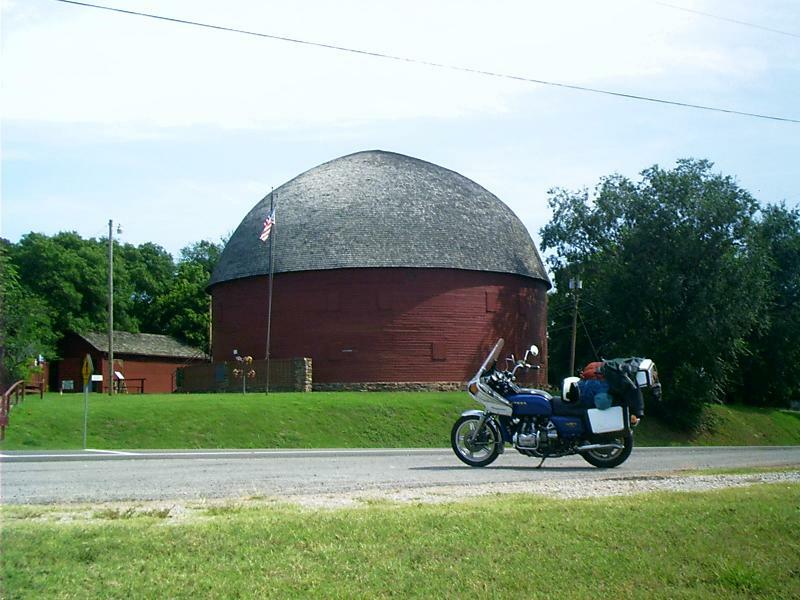 The round barn is a gift shop and a clearinghouse for lore about building and maintaining round barns and locating those still extant throughout North America. You can go in, look around, and exchange questions with the docent if you don't smoke. Be sure to speak slowly and distinctly, though; he's a little hard of understanding. Heading west through Oklahoma ... there is an obvious transition between Midwest and West, between land that is arable, lush, and green and land that is grazed and sparsely vegetated. Forests are left behind, and trees grow only here and there. Oil pumps bow with hypnotic regularity, silently counting underground wealth. Cattle chutes and holding pens are next to the railroad tracks that serve them. Hazy, obstructed views give way to a sky so expansive it seems to level everything beneath it. Even the arc of Route 66 flattens out into a straight line. Rhode, Chuck. 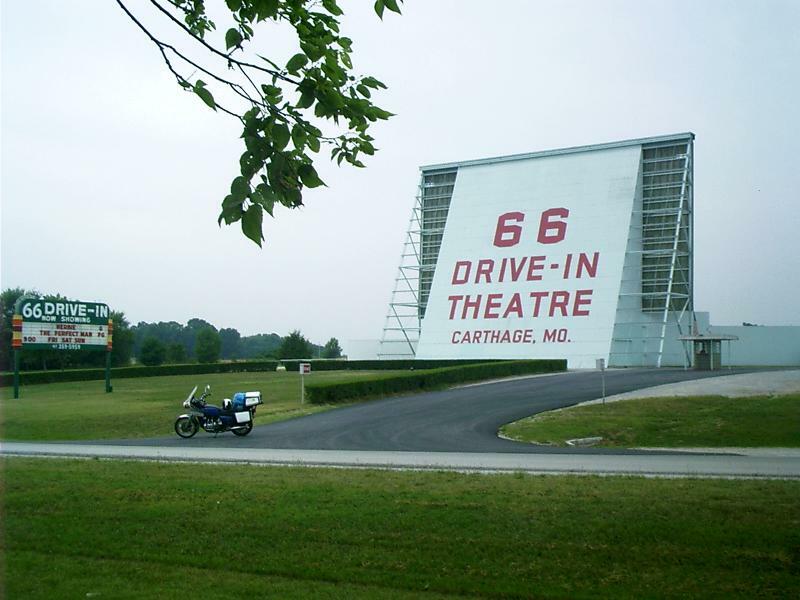 "Old US Route 66: Art and Architecture." The Mother Road and the Natchez Trace. 4 Aug. 2005. Lacus Veris. 25 Apr. 2019 <http://www.lacusveris.com/MotherRoad/Art US66.shtml>. Last modified 6 Oct. 2015. Served 28226 times between 16 May. 2010 and 25 Apr. 2019. Contact mailto:CRhode@LacusVeris.com?subject=LacusVeris.